Rihanna followed Drake, heading to the Basketball match, while Martin Garrix took one of the world's biggest selfies and Iggy Azalea kicked off her tour. These are the pictures you shouldn't have missed this week. 1. 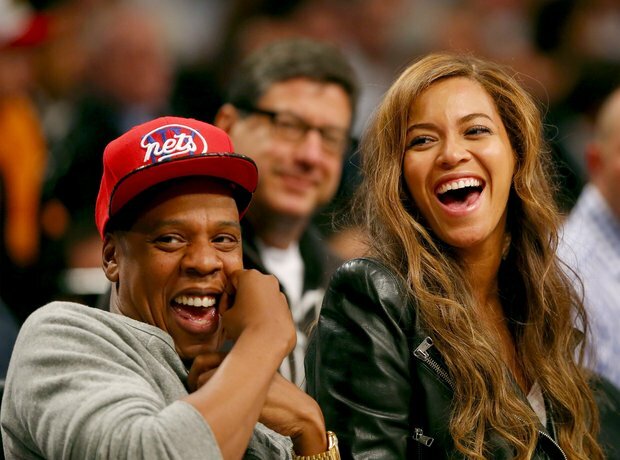 When Beyonce and Jay Z found something really funny a they watched the Toronto Raptors vs. The Nets. 4. Rihanna picked up three awards on the night. 7. And he got all emotional. 10. Avicii showed off his award backstage the iHeartRadio Music Awards. 11. Juicy J and DJ Avicii spent time together backstage. 15. Kid Ink and Steve Aoki were having more fun than anyone else in the studio. 16. Beyoncé was like a kid in a candy shop. 19. Rihanna covered Brazilian Vogue and another shoot she posted online got removed by Instagram. 20. The photoshoot for Rih's Brazilian Vogue shoot got everyone talking. 21. Pharrell attending the Sprint Sound Sessions in New York. 22. Beyoncé showed off her new suit. 23. Rihanna went to Roc Nation Sports' 1 year anniversary lunch. NEW YORK, NY - APRIL 25: Rhianna celebrates in the final minutes of the game between the Brooklyn Nets and the Toronto Raptors in Game Three of the Eastern Conference Quarterfinals during the 2014 NBA Playoffs at the Barclays Center on April 25, 2014 in the Brooklyn borough of New York City.The Brooklyn Nets defeated the Toronto Raptors 102-98. 32. And Rih had some props for the game with her. 33. Beyoncé tried to get a taxi. 34. Jhene Aiko and Big Sean shared some love for each other with this cute photo. 36. Iggy Azalea kicked off her 'The New Classic' Tour in Chicago. 38. Meanwhile, Martin Garrix took a holiday.